Outdoor play equipment in Australia is the perfect way to get your children to play outdoors. The playsets available at Go Easy Online are sure to provide enjoyment and entertainment for children of all ages. Purchasing a kid’s outdoor playset that is too big: Unfortunately, the old phrase ‘bigger is always better’ does not always hold true when you only have a set amount of space for an outdoor playset. Don’t forget to measure how much space you have in your yard before your order. Attempting to assemble the set on your own: It’s important to remember that our wooden playsets in Australia are not small structures. Take the opportunity to invite some friends over and use the extra hands to put the playset together in a way that will cause you the least amount of stress. Trying to rush: Safety is key when putting together a playset. Take your time during the building process to ensure that everything is properly assembled, and every screw is tightened. Any of these mistakes can bring on a headache and take away from time that your child could be playing on their new set. 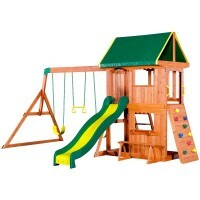 A quality selection: We continuously strive to provide you with a variety of choices for outdoor playsets in Australia. When you purchase one of our playsets, you can rest assured that is made using strong and durable material that is made to last. Come see for yourself: If you are struggling to imagine how a playset looks, we encourage you to see the product in-person at our two-story showroom. Roughly 90% of the products that we sell online are on display at our store. If you have a specific model you would like to see, please call us to confirm that we have it available to view. Different pick-up options: We offer two easy ways for you to get your playset. You can either choose for us to deliver it to you or you can decide to pick it up at our warehouse. Keep in mind that our playsets are large so if you opt to pick it up yourself, make sure that you have a vehicle large enough to transport it. The team at Go Easy Online understands that you have a budget to stick to, which is why we offer you flexible payment choices including using Oxipay or putting your order on layby. Feel free to speak with a member of our team for benefits of each option. To learn more about a backyard playground in Australia, please send us a message. It's a party for the kids of all ages with Lifespan Hillcrest Play Centre! A play centre that b..
Kidkraft Windale Wooden Playset is a compact play centre that kids can be joyful of with its multi-l..
FeaturesThe SomersetThe Somerset outdoor swing set whisks you and your little tikes to the rolling h.. Introducing Sunnydale Play Centre! A play centre built with the known quality cedar wood just like a..
A play centre for all! Lifespan Tanglewood Play Centre brings fun to last for years as it is a ..
Kidkraft Cranbrook Swing Set is an all in one play set to cater kids hunger for fun! Let kids explor..